At TRD every component is precision machined to enhance the performance of our products. Cylinder tubes are lathe cut, not sawed. Piston and rod diameters concentricity is held to within two thousandths of an inch. Every cylinder is truely “square” to eliminate shimming. 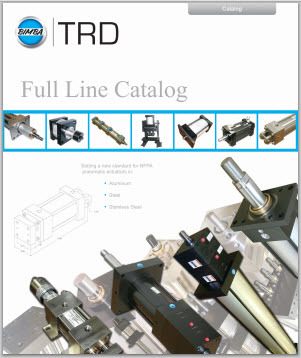 The TRD Difference provides cylinders with consistent performance and long operational life. TRD’s standard cylinder offers a high quality, heavy duty construction in an NFPA tie rod style interchangeable design. These actuators are recognized for their durability and long-lasting performance. Precision machined components from high alloy aluminum. Pneumatic operation up to 250 PSI is standard, and 400 PSI hydraulic non-shock operation is available with the TH option. Ten bore sizes available from 1-1/2" up to 12”. Each cylinder is made to order, adding standard options typically won’t affect delivery times. Standard, oversized, and many special rod sizes available. TRD’s 3-Position cylinders consist of two cylinders built as one unit with one rod end, capable of producing three rod positions. By varying the cylinder stroke lengths, stop positions can be suited to any application. 3-Position cylinders can be built with any single stage cylinders. Simplifies machine designs by eliminating the need for an additional cylinder to create a third position. The micro-adjust option (MA) can be used with this model to create an adjustable mid-stroke position. A variety of options are available to modify these cylinders to any application. TRD’s MH Series cylinders are precision made to deliver more reliable heavy-duty industrial operations. Many of the same features and seals used in the 3000 PSI series are included to increase overall performance and life. NFPA dimension design interchanges with competitive models in the field. TRD offers a wide variety of options as well. Hydraulic operation from 675 to 1500 PSI (depending on bore size). 1.5" to 8” bore sizes; strokes up to 120 inches. Eighteen different NFPA mounts to choose from. Cylinders are made to order, common options typically do not delay shipping. MTS Temposonic or Balluff Micropulse transducers. Balluff Strokemaster end of stroke sensors. Since every cylinder is made to order, you can customize each cylinder to best fit your application. You can choose from our extensive list of standard options, or send us a sketch for a custom solution. TRD does not charge for engineering, CAD drawings, or machine set-up time. Nominal fees to cover "time and material" provide customized cylinders that deliver high value solutions to our customers.